Does anyone else find this kind of advertising completely surreal? I saw this on the side of a terrace house in Darlinghurst the other day. When did this bizarre cult of personality around real estate agents begin? I don’t know about you, but I couldn’t give a tinker’s cuss who the body in a suit is that shows me around a property, and it certainly doesn’t have any bearing and influence on whether I choose to get horrifically in debt by buying it. I remember the agent who sold us our place tried to give us some kind of ridiculous New Age numerology spiel as part of her hard sell, and after we had a verbal agreement with the owners, she was very embarrassed when I caught her showing another couple around the place behind my back. She then had the gall to pretend we were great friends and gave us a fruit basket. For some inexplicable reason, real estate agents think they are today’s rockstars. My suburb is plastered with pictures of their grinning faces and ‘quirky’ advertisements. Another one is a gag-inducing parody of a ‘most wanted’ ad complete with pillock holding a name board in prisoner photo style. Yep, that makes me want to trust you. 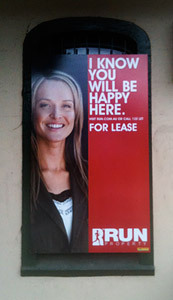 I suppose real estate agents just believe their own hype. They really think a dump that needs to be bulldozed is a ‘home renovator’s delight’, that wardrobes are actually ‘studios’, or that it’s quite acceptable to pretend someone has made an offer on the house you were interested in, when they haven’t. Sorry, but you don’t know if I’ll be happy there. Next time a picture of the house interior would be a damn site more useful than your grinning mug, thanks very much. Have a nice day! Catholics think some aliens may be innocent of the original sin Of course, the Church would still be happy to give ’em war, disease and cultural genocide. Now focus on the cross in the middle. Soon the green dot (!) will eat up all the pink dots and they will disappear (!!). Go back to looking at the pink dots. 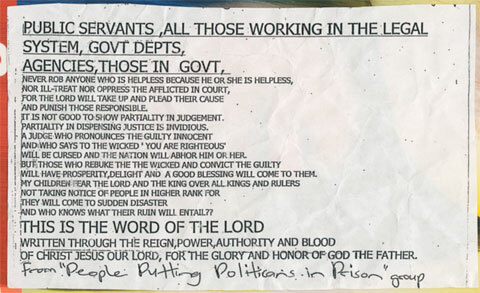 Here’s an edifying little piece of paper someone placed in my mailbox today. I can only assume this poor misguided loony had some kind of unfortunate run-in with the legal system, and has responded in the only effective means they know—wandering the streets slipping bits of paper into people’s mailboxes calling down the wrath of God on corrupt public servants. I suppose this beats walking into the department waving a shotgun, but let’s hope he’s not holding that option in reserve. After all, God’s on his side, right? Personally I wouldn’t get too excited about the Lord above punishing all those naughty folk who rob the helpless and pronounce the guilty innocent. A quick flip through any history book shows the whole divine justice theory isn’t panning out too well. It’s a federal election here in Australia in a week. I wonder if the People Putting Politicians in Prison Group (PPPPG? 4Ps Group?) is running? They might just get my vote! Matching outfits for the family What every good far right Christian Republican family is wearing this season.